In Store & Online: Join their newsletter (Bottom right corner) to receive emails and get a 15% coupon straight to your inbox instantly. Your coupon will look like this. Guaranteed to work. In Store & Online: Offer valid in US Justice stores and online at shopjustice.com. No coupon code necessary. Online: Justice coupon code are not required, discount will apply at checkout automatically. In Store Only: Print or show this coupon in store, code does not work online however some stores will accept. Justice has a 40% off storewide including clearance, the sale takes place in store and online for Columbus weekend, no coupons are required. Get an extra 50% off clearance in justice stores this week. Print out the whole email or show on mobile phone. Use your Justice card to pay in store on Tuedays and get 10% off your entire purchase, valid for the month of march only..
Print out the whole email. Receive a 30% discount in store on clearance items, valid at your nearest justice store. Limit one coupon per customer. Make any purchase at a US and Canadian Justice stores until September 7, 2015 and you will get a $15 coupon to use later. Print coupon and receive 40% off on your entire purchase. Print coupon and receive a 50% discount on your entire purchase. 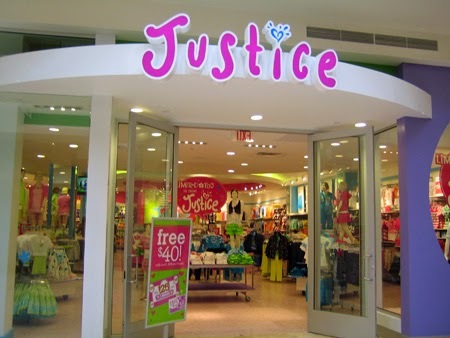 Justice stores offer preteen girls clothing, with a full line of fashions including jeans, tops, shorts, skirts, pants, jeans, sweaters, dresses, outerwear, and swimwear designed to fit the size and taste of 7 to 14 year old teenagers. Use the Justice coupons on this page to save money on your next purchase.